RELIANCE Power’s 4,000 megawatt ultra mega power project in Sidhi district in Madhya Pradesh came close to becoming the first coal-fired power plant in India to be denied financing by a developed country on the pretext of reducing carbon emissions. On June 24, the board of Export-Import Bank of the United States (EXIM) voted “not to proceed with the application from Reliance Power Limited to consider financing of the Sasan (name of village) project in Madhya Pradesh”. 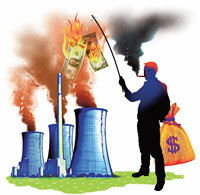 The Indian project was rejected ostensibly to “mitigate the effect of carbon emissions on our climate”. The US, historically the biggest emitter of carbon dioxide (CO2), has refused to take action to reduce its carbon emissions. The bank reversed its decision following a sustained campaign in the US to protect US jobs. EXIM also extracted a promise from Reliance to invest in green energy. The financing is in the form of a US $600-million loan guarantee to Reliance Power for buying coal mining equipment from Bucyrus International, a US manufacturer based in Wisconsin. After the bank’s board rejected the proposal, Reliance Power immediately made it clear that the development will have no impact on its project. “The US $4.5 billion Sasan power project has achieved financial closure and this development will have no adverse impact on the project progress and timelines,” said a Reliance spokesperson. The funding proposal from EXIM was solely to support exports of US-manufactured coal mining equipments and to give the project refinancing flexibility, he added. Industry sources said it was the threat of Reliance moving to other markets to buy equipment which created insecurity in the US. This would have been a big setback to the US power and mining equipment industry and thousands of its workers. EXIM’s initial decision to reject the Reliance application had political repercussions. Republicans, already complaining that President Barack Obama’s cap-and-trade energy bill was leading to huge loss of jobs, protested the decision. They said the rejection of Bucyrus deal would lead to hundreds of people in Wisconsin losing jobs. Several republican senators and Congressmen wrote to the bank and Obama, forcing the bank to reconsider the project. Fred P Hochberg, president and chairman of EXIM Bank, spoke to Anil Ambani, chairperson of Reliance Power, on June 28. Two days later, he wrote to Ambani informing him about the approval. “…Sasan project should be resubmitted for the board’s consideration, including new information. The request will also take into account Reliance Power’s expressed commitment to invest in the renewable energy sector,” the letter read. According to the deal, the bank will sign a memorandum of understanding (MoU) with Reliance. “This MoU would relate to the construction of renewable energy power plants, producing at least 250 MW power, which are expected to produce no carbon emissions,” the letter said. “It is our mutual desire that the project be sourced from United States companies on commercially competitive terms,” the letter added. Denying energy-starved developing countries access to finance to build coalfired power plants has become a practice in the past couple of years. And it is not just the national financial institutions of the developed countries. The US and European governments have been arm twisting the World Bank to reject such power projects, irrespective of the fact that developing countries need to provide millions of people access to energy. Coal is still the cheapest and most affordable option for them. At the beginning of this year, the World Bank refused to fund the Thar coal project in Pakistan. Reports noted the double standards followed by developed countries like the US, which gets more than half its electricity from over 600 coalfired power plants; 60 new plants are planned. Several new coal projects are planned in Europe as well. The civil-society groups in the West also support their governments in denying funds to developing countries for coalfired power plants. In March this year, these groups led a campaign against the World Bank funding the Eskom power project in South Africa. But the bank approved the US $3.7 billion loan despite US and several other European governments abstaining from voting. The activists argue the World Bank should invest in renewable energy projects, but they refuse to elaborate on ways to meet the increased cost of these projects.